It’s All Saints, and this year we mark the centennial of two objects donated to the parish, both of which were dedicated on All Saints Day 1916. The first is a grand piano “for use in the upper room of the Parish House” on Jay Street, but now placed in the south aisle of the Hackett Boulevard church. It was “a gift as a thank offering to the parish by Marcia Brady Tucker, daughter of Mrs. Anthony N. Brady.” We’ve written recently about the generosity of the mother, Mrs. Marcia Ann Myers Brady, particularly the Flora Myers Brady Gavit Memorial Organ that she endowed in 1915. The younger Marcia grew up at St. Paul’s and was married to Carll Tucker here on February 27, 1908. The piano, in an ebony case, was built that same year (as confirmed by the serial number) by the Knabe Company in Baltimore Maryland. The second object dedicated that All Saints Day 100 years ago was the tall clock that continues to keep watch over our coffee hours in the Blue Room. It was given by more than one hundred members of the congregation in memory of three parishioners associated with our Sunday School. You might be surprised that such a lavish gift would be offered for Sunday School volunteers, but in those years St. Paul’s Sunday School was an important part of our corporate life. Total enrollment on November 1, 1915 had been 286, with average Sunday attendance that year of 203. Classes were divided in five departments (Beginners, Primary, Junior, Intermediate and Senior) with 30 teachers, all overseen by 12 officers. Frederick W. Ridgway, Jr. (15 Sep 1896 – 14 Jun 1916), the Assistant Secretary of the Church School, was the son of Frederick W. Ridgway Sr. (St. Paul’s vestryman from 1901 until his death in 1915), and the brother of Dorothy Ridgway, who the next year (1917) would marry our organist and choirmaster, T.F.H. Candlyn. Anna Jaykill Phelps (22 Jan 1857 – 8 Jul 1916), “teacher with a record of nearly 25 years of perfect attendance.” Anna was married to Marcus E. Phelps and had two sons, Charles and Edward. By far the longest serving was the last of these. Ira Porter Jr. had retired as Sunday School librarian about 1905, so his tenure with the Sunday School, went all the way back to almost 1860. He served in the period when St. Paul’s Sunday School was the largest in the city, and when attendance far surpassed even the levels in the early 20th century. The glory years were the 1870s and 1880s, when total enrollment was 600, and average attendance was about 400, with almost fifty teachers. Ira Porter Jr., a member of St. Paul’s for fifty years, had not only served as Sunday School librarian, he was also clerk of the vestry for thirteen years. He was the son of Ira Porter Sr. (1811 – 1892) and Jane Eliza Rice Porter (1818 – 1894). The elder Ira Porter was a St. Paul’s vestryman from 1859 until 1871. Ira Jr. worked at the Albany Customs House for fifty years, ending his career in 1907 as a Special Deputy Surveyor of Customs. This entry was posted in Candlyn, Lancaster Street Building, Sunday School on November 11, 2016 by Paul Nance. It’s Veterans’ Day, or Armistice Day as it was known until 1954. St. Paul’s has many veterans whom we honor, but this year let us remember T. Frederick H. Candlyn, our organist and choirmaster from 1915 until 1943, who fought in the trenches during World War I. Candlyn marched in every Armistice Day parade here beginning with his discharge in 1919 until he left this city in 1943. Candlyn arrived at St. Paul’s in May 1915, having recently immigrated from his birthplace in Davenham, Cheshire, England. While he filed first papers for naturalization in July 1916, Candlyn was still a British citizen in May 1917 when the Selective Service Act of 1917 was passed, requiring all men age 21 to 30 to register for the draft. In his native land, Candlyn (then age 24) would have been exempt, as the only son of a widowed mother, but not in the United States. He registered for the draft on June 5, 1917, and entered the army on September 21, 1917, leaving Albany with the first contingent of draftees for training at Fort Devens, Massachusetts. Candlyn had a brief break from what he described as “a stiff bit of training” at Fort Devens when he returned to Albany to marry Dorothy Ridgway on December 29, 1917. She was a member of St. Paul’s, and the daughter of longtime St. Paul’s vestryman Frederick W. Ridgway. The newlyweds had a brief honeymoon trip, and then Candlyn returned to training. He became a United States citizen on June 25, 1918 at Fort Devens, and must have been shipped overseas soon afterward, assigned to the medical service. We have a description of one of these parades, and some details of his military service thanks to an article by columnist Edgar S. Van Olinda in the Albany Times-Union for November 17, 1941. Those who witnessed the Armistice Day parade last Tuesday probably noted the Governor marching at the head of the column and the lone Civil war veteran, Colonel Hayes, of Brookview riding in the Governor’s open car. But unless you are a consistent curbstone fan or the collector of useless information, you probably missed another very important personage. Once again Dr. T. Frederick H. Candlyn, head of the music department of State College for Teachers, organist and choirmaster of St. Paul’s Episcopal church, paraded in the Legion division. Dr. Candlyn does it every year; not that the stunt is very remarkable, as there are many who do the same thing. The important part is that he wears the same uniform he used overseas, and it is an enlisted man’s uniform at that. Dr. Candlyn arrived at City hall just as Grand Marshal “Gil” Sharp and Carilloneur Floyd Walter were synchronizing watches, preparatory to the tolling of the big bell on the dot of 11, followed by the moment of silence, and “taps.” Both of these gentlemen took time out to congratulate the Doctor on his appearance and to ask, “How do you do it?” Most of the O.D. outfits have long since been carried away by the moths and those which are still in the clothes press are so small that most veterans would need the help of a shoehorn. So, each year, T. Frederick H., on November 11, puts away the tuning fork and baton and dresses himself in the olive drab blouse, breeches and wrapped leggings and does his stuff. What could be more incongruous than our good friend, squatting on the firestep of a trench with a pad of score sheets on his knee, composing a Christmas cantata or a musical setting of the Magnificat with the shells and machine gun bullets whistling overhead? He has written a delightful organ voluntary entitled “An Indian Legend,” which, while not too difficult to play, exhibits the possibilities of the organ stops. We can’t help but wonder if this, too, is a “front-line” composition. In an earlier piece, published in the Times-Union for November 18, 1939, Van Olinda also describes Candlyn’s marching in the Armistice Day parade, and a few additional details of his wartime activities. Dr. Candlyn had an interest in the outcome of the war beyond many Americans, for many of his close relatives still live in England. He stood on the parapet during his trick on watch, slipped on the wet duckboards in the trenches as he lugged rations to his platoon and learned the mechanism of machine gun and hand grenade. But during his rest periods, he jotted down little melodies on paper and when there was entertainment in the “Y” hut, Private Candlyn would be at the piano. T.F.H. Candlyn gave much for his country with this wartime service. But he and his wife were to give once more to his adopted country. One year after that last Armistice Day parade in Albany, the Candlyns’ son Donald Shore Candlyn was killed by a sniper during the the Battle of the Bulge. This entry was posted in Candlyn on November 11, 2016 by Paul Nance. The vestry’s and Rudder’s lack of enthusiasm is palpable. But the vestry purchased the Dudley Reformed Church on Lancaster Street in May 1862 with financing arranged by junior warden John H. Van Antwerp, cashier of the New York State Bank. The congregation held the first service there in September of that year. We do not know how the organ was “reconstructed,” but whatever improvements were made could not hide that fact that it was 74 years old. Brooks must have hoped that the church could afford a new organ to complete the restoration. The organ in use in 1907 was only St. Paul’s second, purchased in 1841, shortly after the congregation moved to the Pearl Street theater. Originally built by Thomas Robjohn (under contract with Firth & Hall of New York City), the instrument was rebuilt in 1857 by William A. Johnson, with the upgraded instrument inaugurated on Christmas Day 1857. Johnson also moved the instrument to Lancaster Street in 1864. William J. Stuart of Albany made major enhancements in 1892, including a new manual, pedal, chest, couplers and combination pedals, but by 1907 it must have been a very old looking (and sounding) organ. Brooks had plans for major enhancements to the church’s liturgy and worship space, including the creation of a boys’ choir, and moving the organ to the renovated chancel. He had the new chancel: a new organ would fit with these plans very nicely! Years passed, and Brooks must have thought about who was capable of buying the church a new organ. His leading candidate would have been the wealthiest member of the congregation, Marcia Ann Myers Brady, who was already a major donor. Mrs. Brady had been a member of the congregation since 1872, and she raised their six children in the church. Her daughter Flora was baptized at St. Paul’s in 1879, attended our Sunday School and was married to E. Palmer Gavit by Dr. Prall, in 1901. Mrs. Brady’s other daughter, Marcia, was married to Carll Tucker at St. Paul’s in 1908. Marcia Ann Myers Brady’s husband, Anthony N. Brady, was a practicing Roman Catholic who may never have seen the interior of St. Paul’s. Mr. Brady had started as a small businessman in Troy and Albany, but by the first decade of the twentieth century he had accumulated an immense fortune by investing in utilities and public transportation across the country. The firms he founded are the direct predecessors of such corporate giants as Consolidated Edison and Union Carbide, among others. Tragedy struck Marcia Ann Myers Brady’s family in October 1912, when her daughter Flora died at age 35 in a fiery train wreck that also killed her sister-in-law and sister-in-law’s sister. Then a year later, Marcia Brady’s husband died, leaving an estate of over $72 million dollars, which in that period in New York was second only to that of John Jacob Astor. The new instrument was dedicated on Palm Sunday, March 28, 1915. Built by the Hutchings Organ Company of Boston, it was a three-manual electric organ, with thirty-five speaking stops, nine couplers, two tremolos and a set of chimes. Only a dozen years later, New York State took the Lancaster Street building as part of the 98 acres needed to build the South Mall, now known as the Empire State Plaza. Any items not removed by the congregation before they left the building became State property The people of St. Paul’s had to make some difficult decisions about what could be taken and used in their new building, and the organ was one of those items left behind. 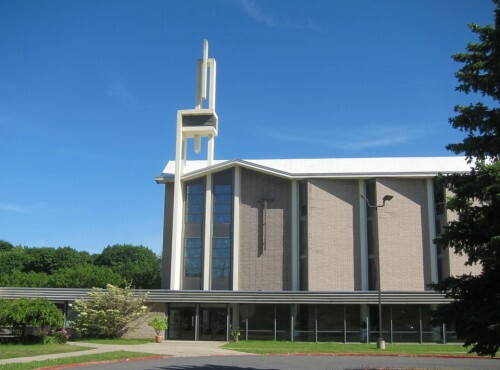 By early 1964, the vestry decided to purchase an organ by Casavant Frères for the new church on Hackett Boulevard, and to allow the State to sell the 1915 organ. Clarence Hollister (St. Paul’s organist and choirmaster from 1955 until 1967) estimated the old organ’s value at $60,000, but said that St. Paul’s had received an estimate of $32,000 to recondition it. Hollister’s opinion was that “I can’t see putting $32,000 into an old organ, which I’m not particularly fond of anyway.”[ix] One wonders how the organ could have deteriorated that much in the twelve years since the 1952 M.P. Möller revisions. It seems more likely that its deficiencies were a matter of changing styles in organ sound rather than actual deterioration. More than a century after it was founded, the Flora Myers Brady Gavit Memorial Organ Funds continue to pay for maintenance of the Casavant organ. The funds, now known as the Gavit Organ Replacement and Gavit Organ Maintenance Fund, paid for a major repair only a few years ago, when organ pipes were beginning to lean precariously over the tenors and basses in the choir’s back row. We hope that Mrs. Brady would have approved. [i] “Sermon of the Rev. William Rudder, D.D.,” in The Semi-centennial Services of St. Paul’s Church, Albany, N.Y. (Albany: The Argus Company, 1877), 37. [ii] “Sermon of the Rev. William Rudder, D.D.,” 36. [iii] “Sermon of the Rev. William Rudder, D.D.,” 40-41. [iv] “Past, Present and Future: a Sermon Preached January 26, 1902 in Commemoration of the Seventy-Fifth Anniversary of the Founding of the Parish of St. Paul’s, Albany, N.Y. by the Rev. William Prall, D.D., Ph.D. Rector” (Albany: Weed-Parsons Printing Co., n.d.), page 17. [v] “Tablet Unveiled in St. Paul’s, Albany N.Y.,” The Churchman 26 Oct 1907, volume 96, number 16, page 649. [vi] “Tablet Unveiled in St. Paul’s, Albany N.Y.”. [vii] “Service of Dedication: Flory Myers Brady Gavit Memorial Organ in in Saint Paul’s Church, Albany, New York” Archives of St. Paul’s Church. [viii] OHS Database http://www.organsociety.org/database/SingleOrganDetails.php?OrganID=49048 retrieved 31 Oct 2016. [ix] Albany Times-Union 21 Jun 1964. [xi] Schenectady Gazette 09 Jul 1964. This entry was posted in Candlyn, Clergy, Hackett Blvd Building, Lancaster Street Building, Music on November 6, 2016 by Paul Nance.